How do you feel when you see news like this in the local press? What if the victim is one of your friend or relatives or worse, a member of your family? There are many accidents like this in the workplaces. Is this a pure accident or something that can be avoided? What has he learned from the narrow escape? Next time he may not be so lucky – of course, no one would like to see this happen again. As far as safety is concerned, we believe that accidents like this can be avoided if rules for confined space entry are followed. First, no one should enter the tugboat before air purging and gas detector is used to monitor the level of oxygen and the presence of toxic gases. 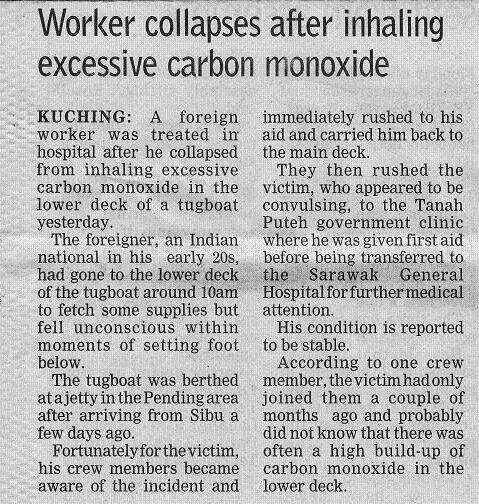 Lowering down an oxygen meter to the lower deck of the tugboat would have shown dangerous low level of oxygen in this case. Using a multiple gas monitor that is normally used in the common industries will surely show high level of Carbon Monoxide (CO) or may show even some others toxic gases. Have they done so? When others were aware he was in danger, rushed to his aid and carried him up to the main deck, how did they do it? There are cases that helpers entered the lower deck in this kind of situation were also killed by the silent killer CO because they did not wear proper respiratory equipments. I have seen an incident that when the employer found that the worker who entered the lower deck of a tugboat did not come up, he sent down another worker to see what has happened. When the second worker did not respond to his call, he himself went down. None of them came up and only later when the employer’s wife called them for lunch, they called the Fire Department. The rescue team went down with SCBA (Self Contained Breathing Apparatus) and came up with three dead men. They were killed by Carbon Monoxide. All these can be avoided if they have knowledge in confine space entry. Do you think that everyone who is working in this kind of industries should attain at least some training in confine space safety?